Lilly meets Ty, black and yellow litter born July 19, 2018. 4 black males, 1 yellow male, 2 yellow female, and 2 black females. Lilly and Ty match up perfectly and will produce pups with a ton of drive, strong natural point, high intelligence, and exceptional looks. Ty is a JH titled male (working toward SH title) and comes to us by way of Holzinger Kennels in Minnesota. 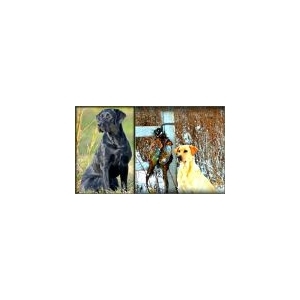 Holzinger Kennels is a very well renowned kennel throughout the U.S. just south of the Twin Cities. Their reputation speaks for itself producing dogs such as GMPR MHR Rik's Risky Raider MH, MPR Wyvernaze Audley MH (Brock), GMPR Cashzingers Cattail Corky, MPR Brocks Golden Nugget, CP Cashzinger Coal Cuts Loose, Cashzingers Special Brew MH, MHR MPR Cashzingers Brier Tuck MH (Tucker), and MHR MPR Horse and Hunt Gabe MH. The accomplishments of dogs from this pedigree are too many too list but there are many GMPR, MH, MHR and National Champions on both sides of this breeding! Lilly and Ty come with all the health clearances. Both have excellent hip ratings, clear on eyes, and normal on elbows. Pups will be EIC/CNM clear by parentage and will come with a 28 month health guarantee. Ty is a 75-80 pound powerhouse that has that same great look Raider possessed. 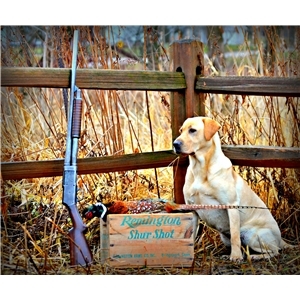 His pups possess a strong desire to hunt and have strong natural point. He has hunted extensively on waterfowl and upland, and he lives to hunt and will go strong all day long! He is a hard charging dog that loves to work, but at the end of the day knows how to settle in. He is an exceptionally great looking male, with that black coat that everyone is looking for. Some notables in his pedigree include GMPR MHR Rik's Risky Raider MH, GMPR Cashzinger’s Brier Tuck MH, Cashzinger’s Special Brew MH, 2xNAFC 2xCNAFC FC CFC Ebonstar Lean Mac, and many more. Ty comes from the same great lines that put many breeders on the map. 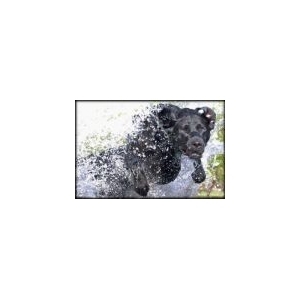 A descendent of Raider, Brew, and Brier, these are some of the most prominent bloodlines in the history of pointing labs, and was an integral part of bringing notoriety to the pointing lab back in the mid-90’s. Simply put, in the pointing world these bloodlines are legendary. Lilly is a 55-60 pound female out of my very last "Belle" litter. She is an athletic freak of nature, and possesses that same look Belle had. I knew with Belle's last litter I wanted something as similar to those traits Belle possessed and she has "it"! She has the same gorgeous look, same athleticism, and the same hard-nosed attitude in the field. What I love most about Lilly is she will go hard all day long, but can shut it down and be a part of the family when the hunt is over! Lilly's pedigree is also quite impressive. Some notables include: GMPR MHR Rik's Risky Raider MH, GMPR Grits of Black Forest SH, GMPR, High Sierra Kodi MH, GMPR Blackwater Lexus, GMPR Wannamakers Hot Tubb SH, and Minn Horse and Hunt Club Thor MH to name a few. These are some of the top bloodlines in the pointing and hunt test world! Lilly is a multi-dimensional dog who gives me whatever I need whenever I want it! She can sit out on the water or in the field all day and retrieve ducks, she can bust through the thickest of pheasant cover day in and day out, or she can settle in by my feet at the end of a long day. I just love how diverse she is! She gives me everything I need in one dog. 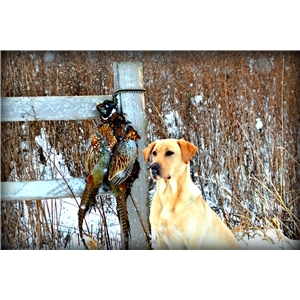 She can hunt waterfowl, pheasant, and sheds with the best of them! Lilly has a BIG BIG motor, but she has an even BIGGER heart! She lives to please, and is type of dog that gives dogs the reputation of "man's best friend". She loves to go wherever I go whether that's bird hunting for the day, hiking through the woods looking for deer sheds, or hopping in the backseat to run some errands! Lilly has an overall great nose, strong marking ability, desire to retrieve, and absolutely loves water! She is the type of dog that is always eager to learn, eager to work, and eager to please! She spends a ton of time in the field every year hunting upland in the Dakotas and Iowa, and water-fowling the "Flyway Highway".